Maria Felix, a tiny lady from Mexico, now living close to an oil refinery in Wilmington California, is celebrating her 106th birthday, a milestone achieved by very few individuals. Maria is deaf, but otherwise healthy and does not take any type of medication. Some of Maria’s children and grandchildren wanted to improve the air quality in Maria’s bedroom, which, as in all homes in the vicinity of oil refineries or other heavy industries, is saturated with many harmful air-born particles. These air-born particles contribute to several chronic diseases, and may even be the cause of death, especially among the elderly and young children. 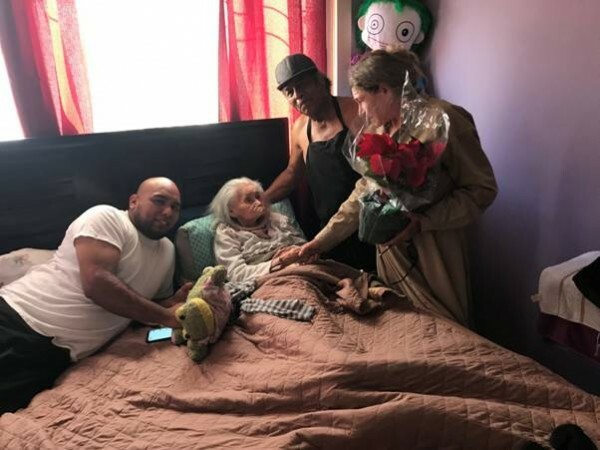 Consequently, MACOMA, an organization dedicated to the improvement of air quality by eliminating harmful particles from the air through photocatalysis, gave Maria her special birthday gift, clean air in her bedroom. On Saturday afternoon, the director of MACOMA, Ezekiel Martin, PhD, and Dr. Tony Pereira, a professor at UCLA, delivered the birthday gift to Maria’s home. After activating the formaldehyde hand-held detector that measures the number of harmful air-born particles and opening the curtains of the small window above Maria’s head, Dr. Martin started to apply, the odorless-non-toxic milky-liquid that contains the “miraculous” photocatalytic nanocrystals of titanium dioxide, to the ceiling in Maria’s bedroom. Only 10 minutes into the application and while small rays of sun-light were illuminating the bedroom, the air-quality measuring device started to show that the number of harmful particles in the air was rapidly diminishing. After Dr. Martin applied the first coat on the ceiling, Maria’s neighbor, 19-year-old Ricardo, volunteered to apply the final second and third coat. The entire application process lasted about 30 minutes. However, the photocatalytic reactions created by the titanium nanocrystals that are now covering the ceiling of the bedroom will eliminate harmful-air-born particles, plus all bad odors, for many years to come, no re-touching or re-application will ever be needed. If Maria’s family had bought the photocatalytic coating, the cost of the product would have been about $130; a very small price for so many lasting benefits. If photocatalytic coatings would be applied on the ceilings and the outside walls of every home in Wilmington; and if the storage cylinders of the refineries would be covered with photocatalytic coatings, Wilmington’s air could compete with the best air-quality places in the world. Be the first to comment on "Oldest woman in the State of California gets 1/2 gallon of FN photocatalytic coating for her 106th Birthday"